Name of company Agrisect INC.
Main clients Takii & CO.,LTD., Idemitsu Kosan Co.,Ltd. August, 2004 Agrisect Inc. was established. Rapid Diagnostic kit in plants ( 17 items ). November, 2004 Agrisect Inc. obtained a dealership registration of the agricultural chemicals. 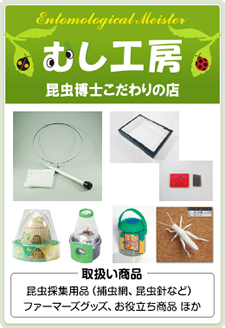 March, 2008 Agrisect Inc. opened a net shop "Mushikoubou" as antenna shop at Rakuten Ichiba.